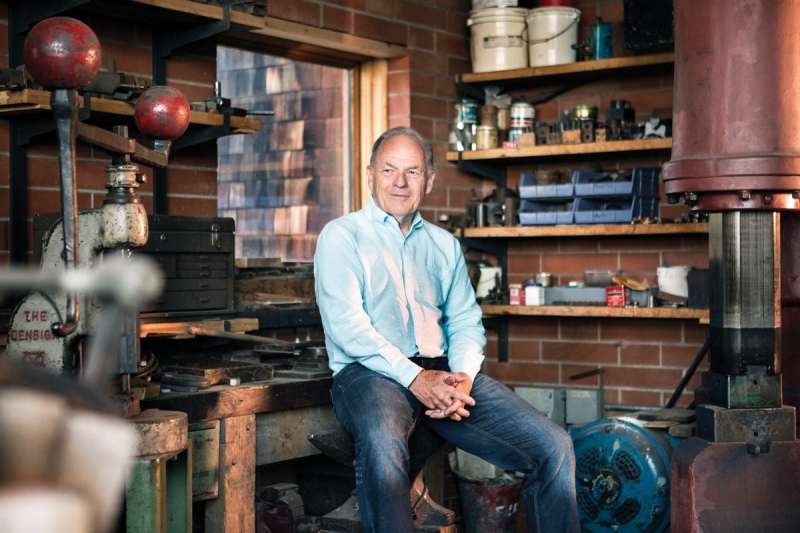 At 69, Ian MacGregor is hard at work building what he describes as Alberta’s economic engine, as well as a subdivision of luxury homes and a private museum. Ian MacGregor in the Canadian Museum of Making. Photograph by Jager & Kokemor. Over the following decades, MacGregor would amass enough cool things to necessitate and fill a private 20,000-square-foot underground museum. 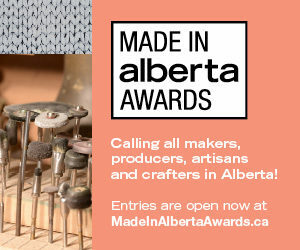 His trove, the Canadian Museum of Making in Cochrane, focuses on machinery from around the world, including an 1895 steam engine from an English weaving mill and tens of thousands of tools, from African metal-work tools to typewriters. Despite having a museum of his own now, MacGregor’s collection runneth over and he has brought a few objects, including a well-used carpenter’s hammer from Cuba and a solar-powered seismic data collector, to his downtown Calgary office. Amid the curios and books there’s also a big framed photo of his late mother, Anna, as a young woman in a red sweater. He adored her. And he inherited at least some of her ingenuity. “My mom could make anything,” he says. Once she even built the winning entry in a contest to see the Ice Capades — a miniature model of the Stampede Corral complete with skaters on the ice and spectators in the stands. Anna MacGregor’s family couldn’t afford to send her to university and she was determined her only child would get an education. “We lived in Renfrew, it was a working-class place and she decided nobody in Renfrew was going to university,” says MacGregor. “So she made my dad move to Brentwood because people who lived in Brentwood were people who would go to university.” It would seem that her plan paid off. MacGregor graduated from the University of Calgary with a mechanical engineering degree in 1971. He headed to the University of Alberta to do his Masters degree, but when a romance went south he did too, ditching grad school and coming back to Calgary to get to work in the oil-and-gas industry. North West Refining partnered with Canadian Natural Resources (CNR) to build the new Sturgeon Refinery near Edmonton, which produced its first diesel late last year. The refinery is expected to reach full capacity this year, producing 80,000 barrels of diesel a day, and despite the drop in price of oil, Alberta producers who send their bitumen there stand to earn more than $20 extra on each barrel. 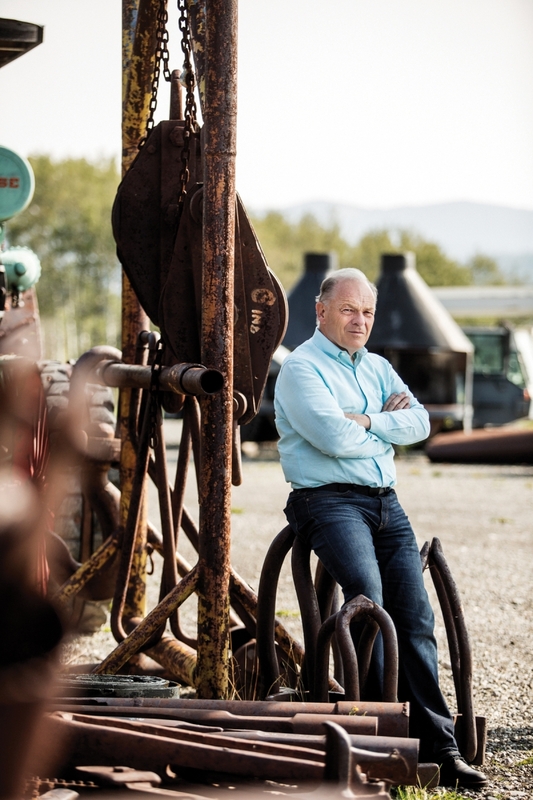 MacGregor wanted to add skilled jobs to the Alberta economy and more value to bitumen by turning diluted bitumen (dilbit) into more expensive diluent and diesel, rather than shipping the raw material elsewhere to be refined. The new refinery, the first one built in Canada in more than 30 years, also tackles another problem MacGregor saw coming long before pipelines started making headlines. “We thought pipelines are going to be really difficult to get approved, so you should use the pipelines we’ve got for the most economically dense material you can ship,” he says. “Diesel is about three-and-a-half times as economically dense as dilbit, so if you use the same pipe for diesel, you can ship three-and-a-half-times as much money out,” he says. This is the culmination of an idea that MacGregor had more than 15 years ago. The Sturgeon Refinery also incorporates the world’s largest carbon capture and storage system (CCS) to pipe and pump the refinery’s CO2 emissions down into old wells across Alberta. It’s the first refinery in the world to be built with CCS included from the beginning. The refinery will supply an independent company with CO2 to be used in enhanced oil recovery, a process that injects CO2 into depleted wells to recover light oil trapped inside. The carbon stays in the ground and the valuable light oil comes out. When complete, the CCS system will have the capacity to manage 10 times the refinery’s emissions. “We think everyone else is going to use it,” says MacGregor. While North West and CNR each own 50 per cent of the refinery, the provincial government helped build it with a 30-year commitment to refine some of the bitumen the province collects in royalties there. The $5.7-billion price tag for phase one has ballooned to $9.5 billion and critics, including former provincial finance minister Ted Morton, have called the refinery a “boondoggle.” Morton and others have also characterized the government’s processing agreement with the refinery as being “effectively” a loan guarantee for the construction costs. Capital costs for building the refinery have nearly doubled, but interest rates are lower than expected, so in the end, the total refinery financing costs are coming in at about the same. “That was luck,” says MacGregor. While he still spends most of his time on the refinery, MacGregor is setting his mind to his next big projects. One of those is organizing the players to build an open source library of big data from Canada’s primary industries — not only oil and gas, but also agriculture, mining, logging and fishing. “Somebody has to coordinate that effort, so I’ve decided that should be my job,” he says with a grin. Sharing this vast information, he believes, will help industry improve operations, reduce costs and protect the environment. Ian MacGregor with items from his Canadian Museum of Making collection. Photograph by Jager & Kokemor. That said, at 69, it might seem like time for him to take on fewer long-term projects. “He has semi-retired a couple of times and every time he ends up with something like the museum,” says his daughter, Kate MacGregor. “So, we try to encourage him not to have free time whenever possible.” An architect and civil engineer, Kate works on M2, a multi-use building east of the Simmons Building in the East Village, that Ian is an advisor for. She also works on Carriag Ridge, a series of homes her dad is developing in the foothills not far from the Museum of Making. MacGregor envisions a giant “park” of homes, each inspired by its particular landscape and designed by an acclaimed architect to be beautiful and to last for generations. He goes out to the first home in the development, Rock House, a couple of times a week to think, work and enjoy the view of the mountains. Designed by award-winning American architect James Cutler and nestled between giant sandstone formations, it was named “Best Cabin” by Wallpaper magazine in 2017. While he happily discusses his favourite machinery, list of projects and his parents, MacGregor is also clear on what he will not talk about publicly. Namely, his wife (“she wouldn’t like that”) and his philanthropy. Trafford, too, remembers being struck by MacGregor’s intelligence when they met in the late 1960s. Over the years he also learned to admire his friend’s determination.